Every year on 29 September the World Heart Federation raises awareness of cardiovascular disease through World Heart Day. 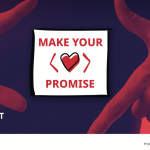 This year they are asking everyone to make a promise (or more!) of how they will take simple steps to live healthier lives. Here are C3’s six promises. If you are looking for an all-year-round commitment that doesn’t involve going teetotal, you can join C3 in having three consecutive days of not drinking each week. There are plenty of strict eating regimes to choose from and certainly no shortage of people telling us ‘what works’ when it comes to diet. There seems to be a new diet to follow every week – from cut out all red meat, cut out all dairy, to starve for two days, eat whatever you please for five, or survive almost entirely on grapefruit juice (yes, really). It can all be pretty confusing. C3 promises to keep it simple instead: reducing portion sizes and adding more greens to our meals. Getting fitter does not have to include a gym membership. We promise to get off the bus one stop early and so add an extra ten or fifteen minutes walk to our day (which can make a difference!). Walking to work can be a great challenge, especially as the weather gets colder. But, there are plenty of good audiobooks and podcasts out there to lose ourselves in as we’re walking. If you live in London or in the south east, avoiding the tube or train strikes is just another reason to start making your commute entirely leg-powered. With our office located near Borough station, we promise to walk to work whenever we can. We promise not to smoke or use tobacco. And if you’re a smoker trying to quit, take heart: research shows that smokers who quit have reduced heart disease risk within only 1 to 2 years after quitting. At C3 our mission is to bring people together from all parts of society (public, private, and non-profit) who don’t normally get together, to implement ways to make it easier for people to live healthy lives. We promise to continue this work in pursuit of creating a more equitable world where the healthy option is the easy option, for all. What promises are you making this World Heart Day? Let us know on Twitter: @C3health.